Daily rituals and habits have always fascinated me. You barely notice your own rituals and habits until you either don’t/can’t do them for some reason or if someone points them out to you. What are your daily creative rituals? What kickstarts your day? I am not a morning person. Partly because as an insomniac I often only manage to finally get to sleep in the early hours around dawn. Partly because waking to me is a form of cruelty because I always feel like I am being cheated from getting a proper rest. Mornings are one of the times of day when most of us enact certain rituals to kick start our day. We have a certain ritualistic schedule of mundane tasks that ready us for whatever the day may bring. From waking up and having a mug of coffee – although sometimes I feel like an intravenous injection is needed – to having a shower, to choosing your outfit for the day and making yourself presentable and finally to eating breakfast. The order you do these things in may be different and you may not be a morning breakfast type of person. But you do eat breakfast. It doesn’t matter whether you do it in the morning after waking up or later on in the day. That first meal, that first refueling of your body, is your wake up moment. A few years ago I read “The Artist’s Way” by Julia Cameron. It resonated with me in so many ways. But one of the most important tools I learnt through that was the Morning Pages. Morning Pages are three pages of longhand, stream of consciousness writing, done first thing in the morning. Until recently I was only doing the morning pages when I was stuck creatively and feeling uninspired. This wasn’t happening every day. I found I was journaling more at the end of my day rather than the start. But recently this has started changing. My “morning pages” have changed. They have turned into “Morning Motivation” – little pep talks I write to myself to begin – but even more recently I have added another “morning” ritual to my day. Just as my body needs a breakfast to break the fast of the night, I felt like my mind needed a creative breakfast to awaken my brain cells. For me, the initial morning pages and then followed by the motivation pages just weren’t cutting it. For some reason it wasn’t unlocking my creativity in my sluggish morning-insomniac-induced-hungover brain. But things have been changing and all because I am now getting the right creative break-fast for my brain. I have started eating poetry for breakfast. I am making it a habit to start the day with poetry. First, I write down a poem or two. (I always “write” my poetry. I need that cathartic, physical process of putting pen to paper.) Then I put aside those raw pieces of poetry and spend some time reading others’ poetry. Often this state of reading will have me putting pen to paper in some more poetry of my own. Before long, my brain’s creative side zings into wakefulness and suddenly I am not feeling so sluggish. For me poetry is the purest form of art. Poetry is the one that truly moves me to feel those down-deep emotions we all feel: the emotions that don’t have a name. Poetry is also the most creative form of art for me. I love playing with images, words, moods, sounds, the surreal and emotions; poetry is the one space I get to do all this. So starting my day with a daily ritual of “eating” poetry for break-fast allows me to enter that creative space immediately. It is a key to that fearless place in me. I need to get into that fearless space each day because then I can face my prose without doubt and filled up with the fearlessness that is poetry for me. What is your break-fast ritual to kick start your creativity? Have you tried morning pages or your own version? Do you refuel with any other art – mine is poetry, yours might be; music, dance, sketching, painting, pottery, sculpture – every morning? What’s your “poetry” to break-the-creativity-fast? This is my invisible reality. This is the Bell Jar that hangs suspended over my life. My Bell Jar is: Chronic Migraine. A genetic neurological disorder. This is not something I speak about often. Partially because it is a fairly invisible illness. Partially because so many people don’t understand what the difference is between headache, migraine and then chronic migraine is. Partially because I do not like admitting vulnerability. Partially because of the inherent shame and guilt I have in having an invisible illness. But no more shame and no more guilt. No more “invisible” illness. Living life is about embracing all of life, the good and the bad, the strengths and the vulnerabilities. This monster that turns my body into a torture chamber has been my constant companion for the last 18 years and counting. For the last 6 years this companion has become a jealous and possessive monster determined to isolate me from those who truly love me. This monster does not live under my bed or in the cupboard like the Bogey Man. This monster has taken permanent and unwelcome residence in my exploding head. Migraine is so much more than a bad headache. Last Words | Who Are You? Was it a last act of revenge from a spurned lover/spouse? Were they the last words she wanted to be remembered by? What comes to your mind when you look at it? 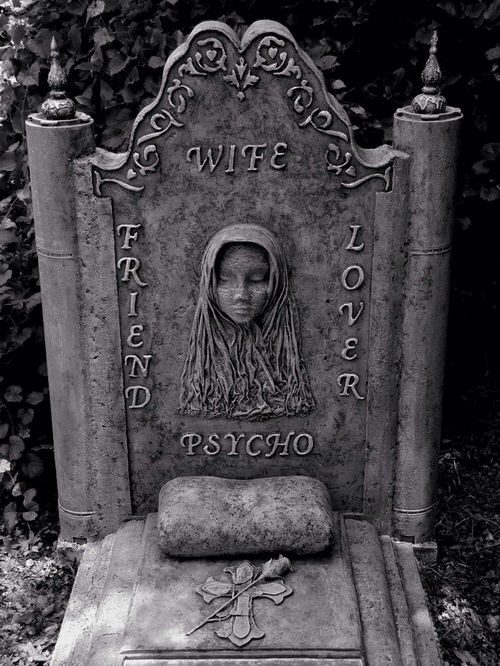 What would you like to be put on your gravestone when you die? This gravestone had me contemplating what I would want inscribed to mark my place in this world. Death is inevitable for every one of us but something that few of us like to contemplate. We are mortal beings but we fear our mortality. We focus on living in the here and now. But I wonder sometimes if we focused on how people would remember us after we die, if that would impact our choices and decisions. She lived and loved fearlessly. the Bird of Poeme` soaring into the heavenly realms. All Hallow’s Eve, Halloween, Samhain, and the Day of the Dead are nearly upon us. What better time to take a look at the darker side of WordPress.com? Our bloggers cover the spooky spectrum, from horror film reviewers to Wiccans to Halloween crafters to bioarchaeologists (they study bones!). This weekend we’re bringing you a double dose of the heebie-jeebies, with Halloween and witchcraft bloggers today, and other offbeat spooky topics tomorrow. Are costumes and crafts more your speed than monsters and mayhem? There’s no shortage of inspiration on WordPress.com, with tons of bloggers dedicated to getting you and your little ones ready for an epic night of trick or treating. We started getting into the Halloween spirit yesterday, with Halloween craft and costume blogs and a look at some of the real-life witches on WordPress.com. Today we continue the Halloween Spooktacular with some less Halloween-y but no less creepy content: horror film buffs, zombie aficionados, and cemetery guides, oh my! If you prefer that ghouls stay safely in movies and books, there are plenty of WordPress.com authors ready to guide you to the scariest of scary movies, like the team of eleven bloggers behind Mutant Reviewers.